“The stealth battle between hospitals and insurers over bills for each hospitalization, office visit, test, piece of equipment and procedure is costly for us all. Twenty-five percent of United States hospital spending — the single most expensive sector in our health care system — is related to administrative costs, “including salaries for staff who handle coding and billing,” according to a study by the Commonwealth Fund. That compares with 16 percent in England and 12 percent in Canada. Why do we need to save the NHS from Trump and May? I declare an interest. In the early 2000s my grandchildren were born in America. Their and their mother’s maternity care cost thousands of dollars, but at least this was covered by her husband’s company’s medical insurance. [Note: this was a number of years before The Affordable Healthcare Act aka ObamaCare, the US healthcare reform law that expanded and improved access to care and curbed spending through regulations and taxes]. Then my American son-in-law was badly injured in a motorcycle accident, and the first priority on the paramedics’ mind as they arrived to deal with his injuries was to ask about his medical insurance. Those without insurance have much bigger problems. Where health care costs are the largest single cause of bankruptcies in the USA, this is US health care writ large! And we read today that maternity costs under Trump’s new healthcare bill are set to rise by 425%. Like everything Trump his statements are all over the place. It’s impossible to know what to believe, the rhetoric or the reality? So on one hand he’s ready to do a trade deal with EU ahead of the UK whereas he has previously promised an early US-UK trade deal. But is all this trade deal worry really a red herring? US corporations will not hesitate to find ways around any trade deal delays and there is already significant US interest and investment in the UK’s health system. In Simon Stevens, head of the NHS, we have a former senior executive from United Health, the giant US health corporate and largest health insurer in the US. What’s known to surprisingly few is that before Cameron recruited him to run England’s NHS, he had special responsibilities for lobbying both to water down ObamaCare, and to push for health to be included in the controversial TTIP transnational ‘trade’ deal. It’s important to recognise that NHS privatisation is a long game. While Sir Richard Branson’s very British Virgin Care is snapping up NHS contracts, almost all American investment in British health care so far has been in the private sector, through acquisitions. Acadia, a Tennessee-based health-care giant, now owns the Priory Group, a chain of expensive and exclusive drying-out clinics and mental-health centres. The Hospital Corporation of America (HCA) owns several private hospitals in Britain. HCA/NHS Ventures partnerships have been formed with NHS trusts to provide clinics and hospitals. 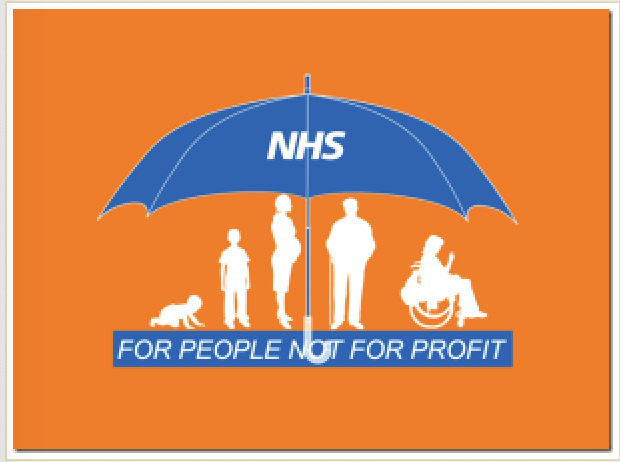 The company’s UK arm is part of the Private Hospitals Alliance, a lobbying group that supports the role of private company participation in NHS services. Certainly, the more the running of the NHS is outsourced to private companies, i.e. privatised, the more US firms will look to capitalise on this. And the more likely a US-model health system will be imposed on my children and grandchildren’s generation. And let’s make no mistake private involvement in public health care will grow in Britain under current policies. A General Election has been called for 8th June 2017. How and when the NHS Bill is [re]introduced will depend on the depth and breadth of support from the MPs that are elected. We believe that campaigning to reinstate the founding vision is critical. In this General Election we will be voting for the future of our NHS. I just wanted to let you know that your eventbright link isn’t working!